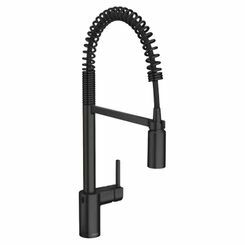 When it comes to buying kitchen sink faucet replacements, it can be quite difficult to choose among so many possible options. After all, you have to take into account multiple features, a host of different finishes, and how it will all fit in with your kitchen theme. Fortunately, you are in the right place! 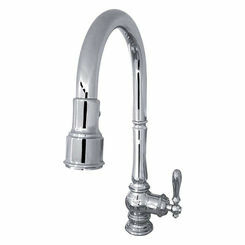 PlumbersStock.com offers the highest quality faucets from only the best brands. 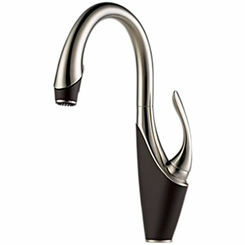 In buying a kitchen faucet, your selection might be driven by the style, functionality, or durability. Consider that there are many features with the latest technology to make your life easier. Keep your habits in mind, you may not need all the bells and whistles, so saving on a more modest option would be a good idea for some. 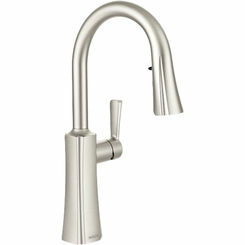 Picking a kitchen faucet is an important decision, and there are an array of options available for you. Make sure the faucet you choose is compatible with your sink. 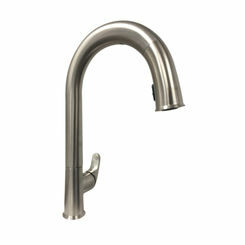 For example, if your sink has two holes and you want a side spray, that means your only option is a single handle faucet. Some two-handle faucets require three holes, while others only require two. Just be aware of this, so you get the right match. 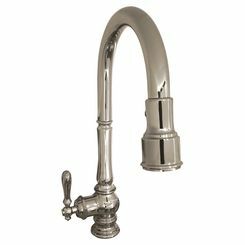 Widespread Faucets - these are much like center-set faucets, it's just that widespread faucets are installed with the spout spread apart from the handles (usually placed anywhere from 6-16 inches). 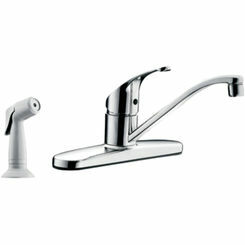 Pull-out Faucets - this is a feature where the faucet can be pulled out and used as a spray wand. It gives you flexibility and range of motion than most other options. 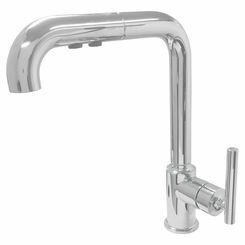 Pull-down Faucets - this is similar to the pull-out feature, except these are usually found in high arc faucets, and the spray head can be pulled down for greater range and flexibility. 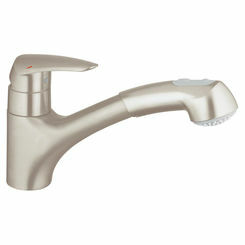 Faucets with Side Sprayers - are used to extend your reach the same way as a detachable spray head on a pull-out faucet, but unlike pull-out faucets, the side sprayer rests next to the faucet. Motion-Sensor - wave goodbye to germs and hello to convenience and cleanliness. With just a wave of your hand, you can turn the water on and off. These faucets have sensors that detect your hand movement to activate the flow of water. 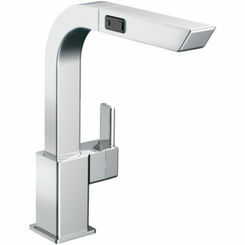 Touch-Sensitive Faucets - not exactly "hands-free", this feature still gives you a lot of the same convenience. With just a simple touch, you can turn the water on and off even if your hands are full and your ten fingers are messy (use the back of your hand). 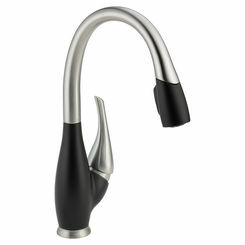 A simple touch anywhere on the spout or handle can activate the water flow. 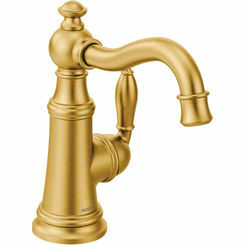 Choose a faucet color that will match your design and complete your kitchen update. There are many options here, such as chrome, black, biscuit, brushed nickel, oil-rubbed bronze, stainless steel, polished brass, polished nickel, satin nickel, Venetian bronze, and more! 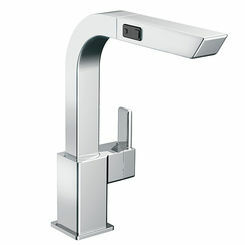 Deck-mount faucets - these are mounted directly onto the countertop, and they rest on the sink. This is by far the most common mount type. 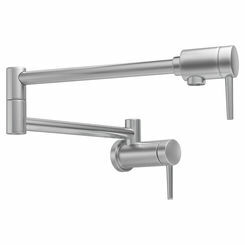 Wall-mount faucets - are mounted on the wall into a vertical surface. They are usually hung above the sink which allows easy cleaning of the countertop and even tall pots, pans, and other items. 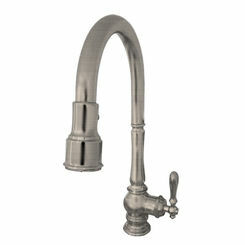 Single-handle faucets - by far the most popular choice in kitchens. With just one handle, the temperature is changed by the direction of rotation. They are easier to operate, thus their popularity. 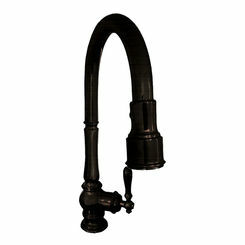 Double-handle faucets - not exactly the most convenient feature, but they look great! Consider a 2-handle option with a motion sensor to get the best of both worlds. The height of the faucet should accommodate your usage. You should consider the arc of the faucet. High-arc installations are suitable for washing large pots and pans, and they give you more space above the rim of the sink. 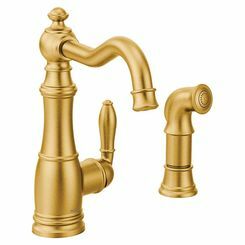 Another consideration is the reach; this has to do more with your preference and with how far you want the spout to extend into the sink. 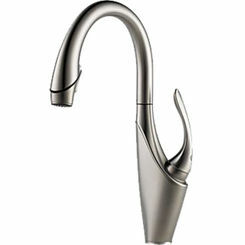 Another factor that can determine the durability of the faucet is the material. The most commonly used materials are stainless steel, solid brass, brass, and bronze. ADA-compliant faucets are designed for ease of use so that they are more accommodating to users with special needs. This means they are made to function using just one hand to operate them, and with a maximum of five pounds of force (no need for grasping or twisting). 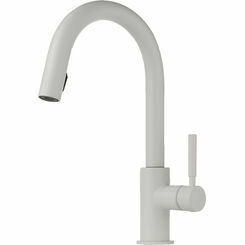 Perhaps one of the most significant problems with many faucets is their propensity to waste water during use. Running a faucet can use an incredible amount of water over a period of a year. 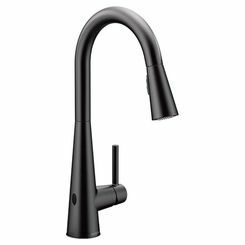 Fortunately, many kitchen sink faucets are made to combat that water waste by lowering the amount of water being used per second and ensuring efficient use of faucets. You can look for the WaterSense label, which indicates high performance and water efficiency. These faucets reduce water use about 30 percent or more in your home. That saves you money on your utility bills without sacrificing performance. 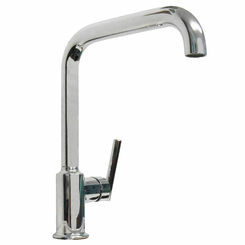 PlumbersStock offers an array of WaterSense-certified faucets. 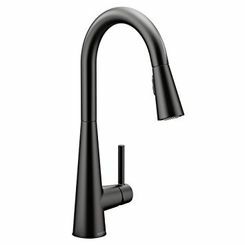 You can check out this helpful short installation video of How to Install a Kitchen Faucet demonstrated by Tim Carter. You can get some more ideas and knowledge on how to do it, and you may find it easier than you think. 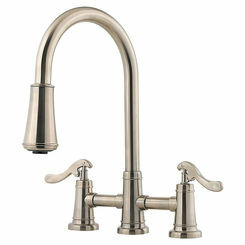 Choose one of our discount kitchen sinks to go along with your new faucet.